Adolph Sylvester ("Bud") Herseth ha suonato come prima tromba nella Chicago Symphony Orchestra da quando ne è diventato membro nel 1948 fino al suo pensionamento nel 2001 (53 anni!). Viene considerato come uno dei migliori trombettisti d'orchestra del mondo. "Mi ricordo molto distintamente la prima volta che ho suonato in banda. Era un concerto estivo della banda sulla strada principale di quella piccola città. Ero seduto sul palco della banda, suonando come 3ª o 4ª tromba in una piccola marcia. Avevo solo 8 anni all'epoca, ma lo ricordo ancora adesso. [...] E non mi dimenticherò mai mio padre guardare verso di me e sorridermi un paio di volte. Poteva vedere che lo apprezzavo veramente." Il primo insegnante fu James Greco, durante l'estate del 1937 quando andò al primo campo che Gerald Prescott teneva all'Università del Minnesota. Aveva sentito Herseth suonare ad un raduno regionale e l'aveva invitato per suonare da cornetta solista nella banda estiva. "Fu un periodo straordinario." Ulteriori insegnanti furono Marcel Lafosse e Georges Mager, al New England Conservatory di Boston, dove andò per due anni e mezzo, sfruttando il GI Bill [opportunità offerta ai militari in servizio ed ai veterani di frequentare fino a 36 mesi una scuola formativa] dopo la seconda guerra mondiale. Il primo anno e mezzo Herseth studiò con Lafosse (la seconda tromba della Boston Symphony, poiché la classe della prima tromba, Mager, era piena) e con Mager per il suo anno finale. Mager era un trombettista d'orchestra molto famoso a quei tempi - suonò a Boston sotto la direzione di Koussevitsky e di Monteaux per oltre 30 anni. Fu un suonatore molto emozionante ed un insegnante molto incoraggiante. "Devo molto a quell'uomo." Louis Davidson - "Una delle prime registrazioni che avevo a casa - una di quelle che ho ascoltato di più era la registrazione della 1ª Sinfonia di Shostakovitch della Cleveland Orchestra diretta da Artur Rodzinski. A quei tempi non sapevo chi era la prima tromba, ma ero molto impressionato da quella registrazione. Più tardi ho sentito Louis diverse volte di persona e l'ho sempre ritenuto un suonatore meraviglioso e molto elegante. Ho sentito tante cose che mi piacevano nel suo suonare." Harry Glantz - Glanz ha suonato nella New York Philharmonic (con Mengelberg, Toscanini e altri) per poi andare alla NBC Orchestra uno o due anni dopo la sua formazione. Ebbe una grande influenza su tutti i suonatori di tromba sinfonici. One of the first records we had at home - one I played a lot was the recording of the Shostakovitch First Symphony by the Cleveland Orchestra with Artur Rodzinski conducting. I didn't know at that time who the first trumpet player was, but I was very impressed with that recording. Later I heard Louis several times in person and I always thought him a really very elegant and marvelous player. I heard many things that I liked in his playing." Harry Glantz Glanz played in the New York Philharmonic (Mengelberg, Toscanini, others) then moved over to the NBC Orchestra a year or two after it was formed. He was a big influence on all symphonic trumpet players. "With Glantz I think I was more impressed with the solidity of his playing. To my way of thinking he was not as inspiring a player-in terms of really getting turned on when he played-as Mager was. But he was very reliable, with an excellent sound and style of playing-one that I think probably influenced more players than any other during that period." Maurice Andre"Well, let's face it, Andre is . . . he's it in terms of solo playing. The guy sounds fabulous, that's all . . .that's all I can say. I heard him play live a couple of times, once in Amsterdam, and also in this area. I have nothing but the greatest admiration for the man's playing-fabulous." He also list other player's: Adolf Scherbaum's playing because he was the first to really go into the Baroque high trumpet playing in a big way-a very exciting player. And jazzplayers like Maynard Ferguson: "Yes, I think Maynard Ferguson is the greatest brass player in this part of the century." The Swedish tenor Jussi Bjoerling. "Ahh ,.. his singing was out of slight, out of sight." Frank Sinatra "The guy really puts across the lyrics of a tune." "As far as the individual players are concerned, preparing for the job is just mainly keeping up with fundamentals. I practice scales, long tones, and nice broad vocalise-type studies every day." He try to vary it quite a bit, but there are several books he use, like the Charlier 36 Etudes, the Walter Smith Top Tones, the Herbert L. Clarke second and third books. And of course he practice the difficult things that are coming up. But he try not to over-practice and go stale on them. He always like to go on the stage with the feeling that he is doing this for the first time. . . "and let's really go!" Bud does not use any particularly warmup routine. "I do believe in warming up, and as I grow older I find that it takes a little longer to get all the brain cells and all the red corpuscles going. It's a fact of life. You know, a warmup is just a practice session gradually approached - that's really all it is. You try to cover some of the fundamentals, first of all to get a nice freely-produced musical quality sound. And then you go through a few articulations, and gradually extend the range until your top, bottom, and middle registers, articulations, and lungs, are all there." Herseth uses a Bach 1B mouthpiece with 22 size throat, and sometimes a 1, both on the C trumpet that he uses 99 percent of the time. On the higher pitched trumpets (piccolo for the Bach Brandenburg) he uses a shallower cup. Here are some notes that Tim Kent took when he studied with Bud. Here are some comments from Bud that Bill Dishman compiled and sent to TPIN. In the book Arnold Jacobs: Song and Wind, by WindSong Press you can find an appendix with info on all the brass players in Chicago Symphony Orchestra (CSO). The author, Brian Frederiksen has given permission to use this info here. CSO recorded Mahler 5th in Germany, 1997. Here is an incomplete list of his recordings. Except for a few (where Assitant Principal played), Bud play on all the CSO records (where there are trumpet parts) for the last 50 years! His anchesters came from Norway, so in 1977, he visited Norway to see the places where his relatives lives (in Stange in Hedemark). He also held a seminar. Sources: THE INSTRUMENTALIST (April 1977), Trumpet Profiles by Louis Davidson. Except for a few (where Assitant Principal played), Bud play on all the CSO records (where there are trumpet parts) for the last 50 years! Several recordings with Mahler Symphonies, Also Sprach Zarathustra, Picture from an Exibition etc.,etc. Contrasts for Trumpets (Doyen #DOY CD009) 1991 which features a number of trumpet ensemble pieces played by Bud, Tony Plog, Bo Nilsson, Urban Agnas, Claes Stromblad, and Otto Sauter. There was a recording in CBS's Music From Ravinia series on which Bud plays L'Histoire du Soldat. 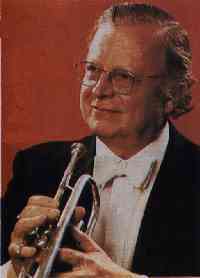 Mr. Herseth played the first part on Oskar Bohme's Sextet in E flat Minor with The Asbury Brass Quintet. The CD is on Albany Records, Troy273.